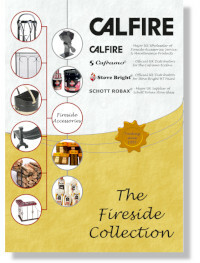 CALFIRE are a major Importer and Distributor of Fireside and Heating Products. These products are offered for sale through specialist stores across the UK. In November 2010 CALFIRE took over the supply and distribution of the exceptional Kingsworthy Foundry range of fireside accessories for log and coal burning fires. As a result CALFIRE now offer the most comprehensive range of quality cast iron firebacks, firebaskets, swansnest baskets, ducksnest baskets, firedogs and reeded panels together with superb quality British Made steel firebaskets and blacksmith produced firedogs. You are welcome to view our entire product range by selecting from the main product tabs above and then by choosing from the options that appear on the left hand side of the page. We have provided an email facility to contact us and will be only too pleased to provide details of local stockists.